Blueberry cottage available for first time this summer season, so book now! Delawana Resort > News > Blueberry cottage available for first time this summer season, so book now! Treasure the last few days of summer by renting out the ever so popular Blueberry cottage at Delawana Resort in Muskoka, Ontario! For just $1000, 2 adults and 2 children under the age of 17 can enjoy the Blueberry cottage for the week of August 28th – September 4th. 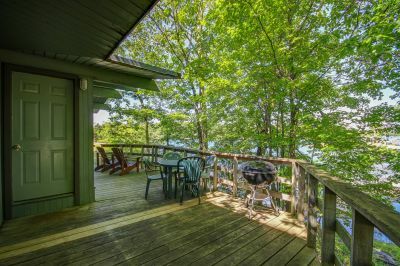 Start your morning at Delawana off by enjoying a warm coffee on your beautiful private porch overlooking Georgian Bay. Spend your day using Delawana’s amenities such as kayaking, boat rentals, swimming, tennis courts and more! End your night by having a delicious and affordable meal at The Narrows Grill followed by a bonfire at your cottages private fire pit. Sadly, the warm summer days are quickly coming to an end but it’s not too late to book one of Delawanas’ cottages. The Blueberry cottage hasn’t been available all season long so this is your chance to book a reservation! Delawana also has 4 Spruces rooms available for Labour Day Weekend. To book your spot at the Blueberry or at any other accommodation, please call Guest Services at 1-888-557-0980.